Many veterinarians will say that it is unnecessary to feed fruits and vegetables to your dog. They may recommend commercially produced dog food which is supposedly complete nutrition for your dog. As we have discussed in this article, commercial pet food is more commercial than food. Just as with humans, fruits and vegetables are a healthy part of an omnivore dog’s diet. If you feed your dog a raw or ancestral diet, fruits and vegetables will be a perfect nutritional addition. Below is a gallery which is a starting point as a list of fruits and vegetables that are healthy for your dog. Introduce them slowly and in a way which is easy for your pooch to consume. Slices or chunks may be fine with some items. A food-processed, “pre-digested” or cooked state might work better for others. Sounds weird but pre-chewing your dog’s vegetables may be helpful with some produce, if you serve it raw. Small amounts are always a good idea, so you don’t disrupt your dog’s digestive system. Click the arrows to scroll through the produce aisle. Apple slices help clean your dog’s teeth and freshen their breath. They’re a good source of fiber, vitamins A and C.
Make sure to remove seeds. Bananas are a good source of potassium, magnesium, vitamin C, vitamin B6 and fibre. Broccoli is a good source of fibre and vitamin C.
Small quantities are good. Don’t overdo it. Cantaloupe is a good source of vitamins C, E, A and B complex. A few small chunks make a nice treat. Celery is very low in fat and is a good source of fibre, vitamins A, C, and K, folate, potassium, and manganese. Leafy green vegetables (including kale, spinach and lettuce) are low in calories and fat, and high in protein, fibre, vitamin C, A, carotenoids, folate, manganese and vitamin K.
Loaded with plant fibre, vitamins K, C, and manganese. Kids don’t like ’em. Many dogs do. A good source of vitamin B, thiamine, phosphorous and potassium. Try frozen peas as a yummy treat. A good source of vitamin C, fibre and antioxidants. Talk about a tasty, healthy treat! Good source of fibre, vitamins B6, C, beta carotene, and manganese. Serve steamed to retain nutrients. Good source of vitamins A, B6, C, and potassium. The rind may cause stomach upset. Can be served raw or slightly cooked, depending on your dog’s preference. There are some fruits and vegetables which are to be avoided as well. 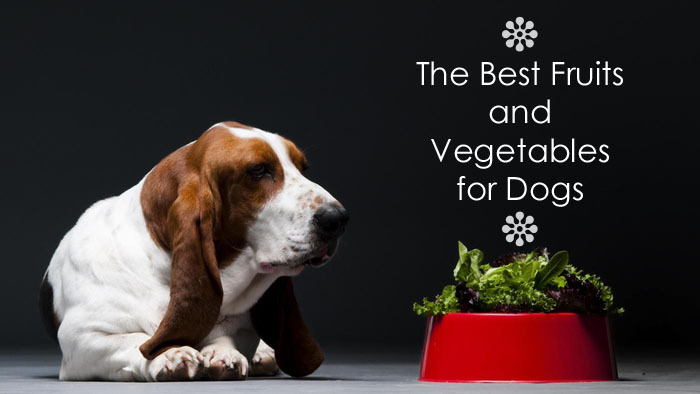 From balancing pH levels to providing vitamins, minerals and antioxidants in a way which is natural and effective for omnivores, fruits and veggies offer life-giving and disease busting benefits for your dog. Don’t be shy to carefully introduce them as a part of their everyday nutrition, up to about 25% of their diet.